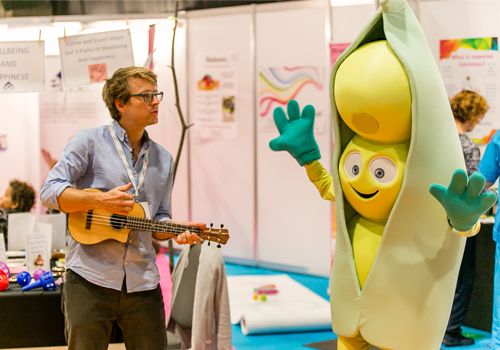 Peas and ukuleles – it’s the EYN Partnership at Childcare Expo Midlands! We know how important it is to implement healthy eating habits into children’s lifestyles as early as possible. By doing this in a fun and accessible way, it’s much more likely that they’ll grow into adults who have positive attitudes at mealtimes. 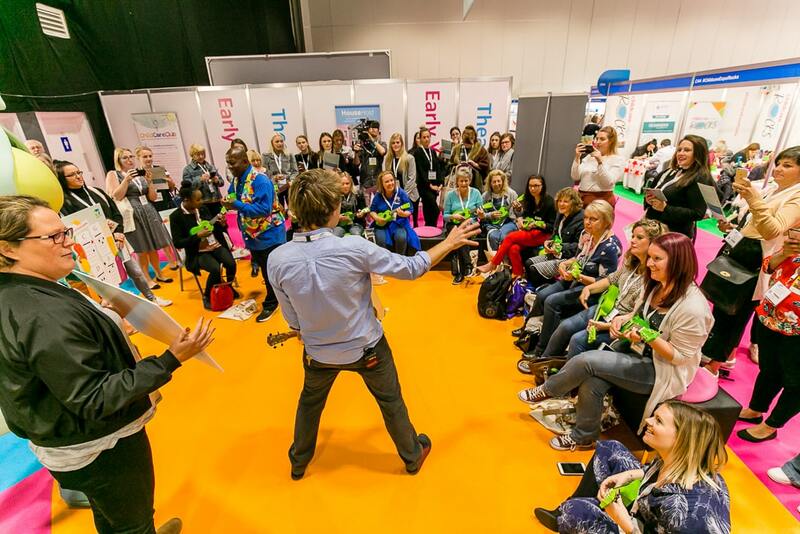 This is one of the reasons that we’ve loved attending Childcare Expo over the years. Sharing the key messages associated with nutrition in the early years is our focus and being in the same environment as like-minded individuals is a brilliant opportunity to elevate this. 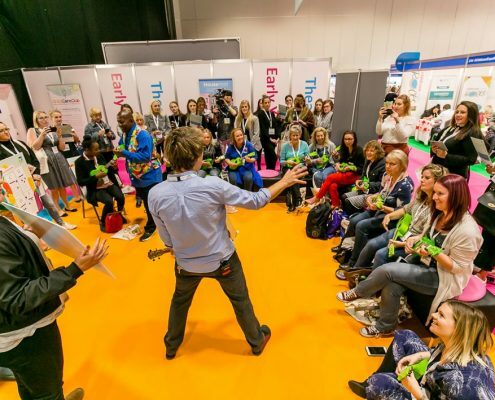 The final Childcare Expo of the year was definitely the best way to round off what’s been an extremely productive year for the EYN Partnership. The event was a wonderful blend of activities. Our team of Registered Nutrition Professionals supervised the stand and chatted all things early years nutrition to the eager visitors, from parents to childminders, nursery practitioners to other exhibitors, which we hope was beneficial for everyone involved. 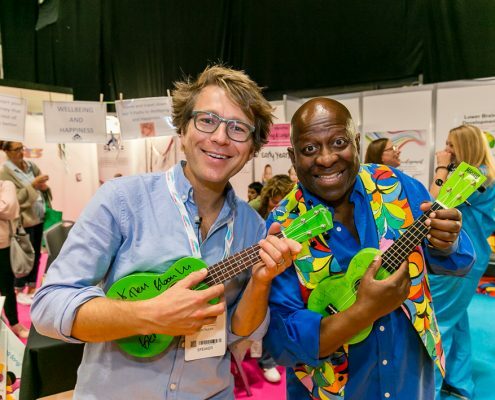 Additionally, some of us oversaw the Nutrition Area within the Health and Wellbeing Zone, an idea that proved such a hit at the previous Expo in Manchester, that we simply had to bring it to the Midlands as well. This saw some brilliant creations conjured up – the Healthy Eating Wall designs, a community of friendly fruit and veg characters, and the planting of lots of pea seeds! 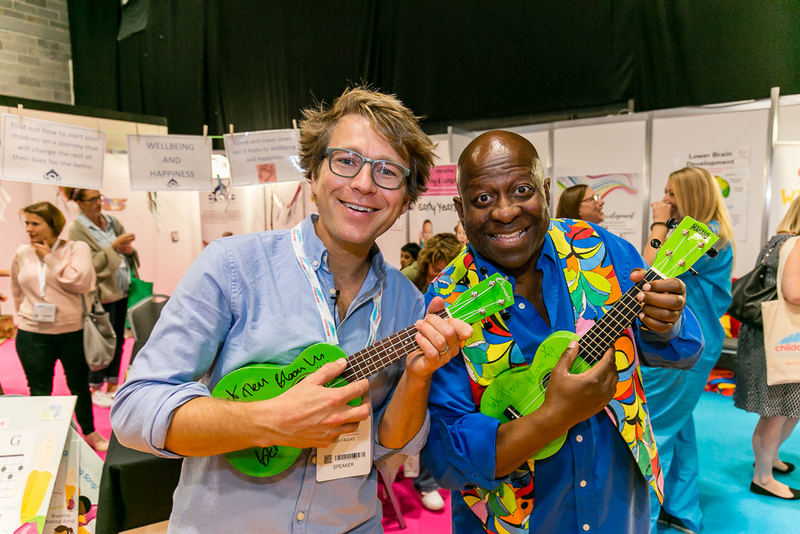 However, the real highlight had to be catching up with Ben Faulks, also known as Mr Bloom on CBeebies, who was joined by long-standing CBBC presenter Dave Benson Philips to teach our very engaged audience how to play The Healthy Eating Song. Using a melodious mixture of their vocal chords and the ukuleles certainly paid off, as we were blown away by how great everyone sounded! There was an impressive turnout at each of these sessions, so thank you to everyone who played a part in transforming this corner of the arena into a gig venue! We’re passionate about giving children the healthiest possible start to life. However, despite our name, we don’t think healthy eating is the only route to achieve this – creativity, confidence and socialising over music, and arts and crafts can all accompany food to prioritise overall health and wellbeing, in all its many forms. 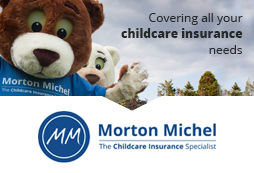 Thanks again to everyone who was so keen to learn about the EYNP at the September show – and of course to Childcare Expo for being such fantastic hosts. Don’t forget that you can keep up with all the latest EYNP news at any time on our website, Facebook, Twitter, Instagram or via hello@eynpartnership.org. Book review: How to Hide a Lion Is your setting ready to become a Plastic Free Champion?